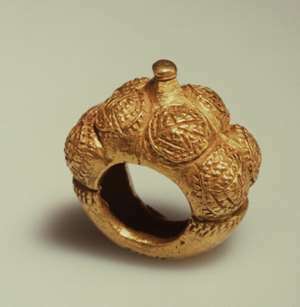 Asante gold ring, Ghana, now in Afrika Museum, Berg en Dal, Netherlands. There has been much comment on Dutch museums moving ahead in the matter of restitution of looted colonial artefacts. Some have suggested that the Dutch are far ahead of the French and the Germans on this issue. (2) What has happened to create for the Dutch State and museums such a favourable press and reputation? Relief plaque, Oba Esigie, Benin, Nigerian, now in Tropenmuseum, Amsterdam, Netherlands. A few days after the NMVW rules had been issued, the Rijksmuseum(which is not part of NMVW) announced that the return of objects should have started long ago; that they were not waiting for claimants to turn up with claims, but that they were sending a senior official to Sri Lanka to discuss the issue of return of looted artefacts taken from that country in the colonial era. There are a lot of theatrics in this area too. We see in the independent acts of the museums, in the absence of a national policy, a reflection of a rivalry between the museums which most probably has nothing to do with return of looted artefacts but reflects historical rivalry or structural competition in the Dutch museum world. Before we assess the new rules of the NMVW, let us take a look at some of the rules and what they provide. Section 4 specifies the criteria under which objects can be claimed, providing three categories of claims: questions of legality, involuntary separation and heritage value. Claims may fall under one or more of these categories. Claimant must show that the object was ‘collected/acquired in contravention of the standards of legality at the time’. This may include proof that the object was ‘Acquired from a possessor who acted in contravention of standards of legality at that time and who did not have legal right of ownership or a possessor who since acquisition has engaged in illegal practices relating to the ownership’ of the object. The object was acquired without the consent of the owners or was acquired under conditions of duress that amounts to forced sale or that the object was acquired from a person who was not culturally authorized to dispose of the object. A claimant may also show that the object is of such a cultural value, heritage or religious, to the communities that its continued retention in the collection of NMVW can be tested in relation to analogous standards articulated by the Heritage Act (Erfgoedwet) 2016 for Dutch National Heritage and Culture. This may include objects whose sacred purpose makes them unsuited to public display and continued scientific research and that the relative national historical significance outside the Netherlands or influence on continuous cultural well being outside the Netherlands outweighs all benefits of national retention in the Netherlands. Once the claim is assessed as falling within the scope of article 4, it will be evaluated through detailed provenance research. Claims must include documents of ownership and history of possession, connection between claimant and the claimed object, cultural and national context and information on any other potential claimants. 5.3.1. Standards of continued custodianship: the benefits of safeguarding cultural objects to ensure as far as possible that they are used for cultural and heritage purposes when returned to the nations and/or communities of origin. 5.3.3 Cultural continuity/genuine link: a demonstrable continuity/genuine link between claimants and the cultural object(s) claimed, in terms of national, heritage, persistence of beliefs, persistence of culture. 5.3.4 Just and fair solutions: this may include recommendations for models alternative to return that are acceptable to all parties – these might be exhibitions, loans, and sharing of information and knowledge on a number of platforms This may include strategies for ongoing collaborative/relationship building. Once a claim has been submitted to the museum, the NMVM staff do research on the claim and the NMVM sends the claim with provisional recommendations to a Standing Advisory Committee which then makes its recommendation to the Director of NMVM and to the Minister for Culture who then makes the final decision regarding claim of restitution of the object. 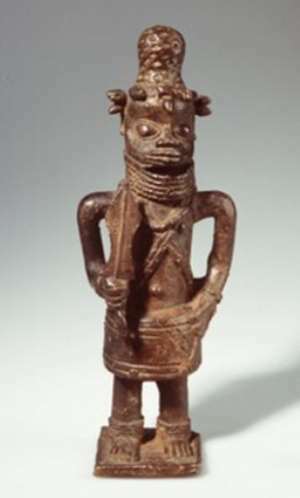 Statue of a court clerk, Benin, Nigeria, now in Volkenkunde Museum, Leiden, Netherlands. ASSESSMENT OF THE NEW GUIDELINES. A quick reading of these rules shows that there is really no ground for euphoria about the new Dutch rules regarding claims for return of looted artefacts. To start with, the word used in the text is ‘return’ and not ‘restitution’. The glossary to the rules gives the following explanation: ‘Return/restitution/repatriation: All these terms refer to mechanisms for transfer of cultural objects This framework uses the term return to cover meanings implied by the terms restitution (transfer of stolen material in the strict sense) and reparation (the transfer of material ascribed to a particular cultural patrimony). With all due respect to the framers of the rules, in discussions over looted cultural property in the colonial period, efforts have been made to distinguish ‘return’ from ‘restitution.’ Return has been used to signify the act of transmitting an object to the country of origin or person without any further legal implication. Restitution has been used to signify not only a return of the physical object but also a recognition or admission of the fact that the initial taking of the object was wrong and that restitution signifies a desire for new relations that are not based on force. It is the implication of admission of wrong-doing that causes many Europeans to object to the use of the word restitution. They do not want to admit that the colonial system was a regime of force and violence. They do not want to accept that the illegal holders are now returning the objects to their rightful owners who have been deprived of their use for a long period and therefore some compensation would be in order. Apparently, in the museums in the land of Hugo Grotius nobody cares about such distinctions. The European attitudes here are, to say the least, unusual. There is no attempt to do justice to people who have been deprived of their artefacts for over hundred years. It is when we look at section 5.3.4 of the rules that it becomes a little clearer why the drafter of the rules may have preferred to give to the word ‘return’ a very open and vague definition. This section provides that on application for return of cultural property, the Standing Committee may make ‘recommendations for models alternative to return that are acceptable to all parties – these might be exhibitions, loans, and sharing information and knowledge on a number of platforms. This may include strategies for ongoing collaboration/relationship building’. So, a demand by a country or a community for the restitution of its cultural property may end up in an exhibition or sharing of information. Are they then still dealing with a demand for return? Only the future practice of the museum and the Standing Committee will tell us what all this means concretely. But the provision recalls similar provisions in the German rules that try to discourage any idea that restitution of the looted object should be the normal practice. It is to be noted that these rules are being established by an institution that has no right to dispose of museum objects which are generally State property so that the fulfilment of all the requirements of the guidelines do not guarantee a positive decision. The minister may decide on grounds that are not related to the object. There is no mention of appeal either from decisions of the Standing Advisory Committee, of the museum nor of the minister. On whom are these rules then binding? Apparently only on the claimants who had no hand in formulating these rules which are said to be non-adversarial although much is waited against the claimant who is treated as an adversary. Another interesting provision is section 5.3.1 entitled ‘Standards of continued custodianship: the benefits of safeguarding cultural objects to ensure as far as possible they are used for cultural and heritage purposes when returned to the nations and/or communities of origin’. This is the famous demand of Europeans and other Westerners to have a right of oversight over looted African artefacts even after they have been returned to their countries of origin. To many Africans, it sounds like a thief who has stolen my Mercedes and when finally obliged to consider its returns says he will do so but on condition that it is used for transporting persons and not transporting goods. But from where do the successors of former colonialists and slave-masters have the right to dictate conditions of use of the returned looted/stolen object? This demand of Europeans of a right of oversight on African artefacts shows a regression to the colonial and racist mentality. Nobody would think of requiring this from victims of Nazi looting nor of the Chinese. The reluctance of Europeans to let go African artefacts to their owners must be analysed by psychiatrists and psychologists. The Dutch are clearly following a policy of loans proposed within the Benin Dialogue Group, where NMVW is represented, so it will not be convincing without further proof to suggest that they are thinking of restitution, a word which is not even used in the new rules as mentioned above. (4) How can newspapers then report that the Dutch are moving ahead on the question of restitution? In deciding on claims submitted one of the considerations is stated in section 5.3.3 as follows ‘Cultural continuity/genuine link: a demonstrable continuity/genuine link between the claimants and the cultural object(s) claimed, in terms of national heritage, persistence of beliefs, persistence of culture’. This is a good example of those situations where Europeans make rules for non-Europeans where racism clearly influences the thinking process but is not perceptible to them because racism is generally, pervasive in many European minds. If we look at European culture, we would easily agree that it has evolved over the centuries and that many practices that were common in the olden days are no longer seen nor are the instruments used any longer available for such practices. The guillotine and similar instruments and methods from the European past, are no longer of current usage but would anybody deny that those guillotines found in France belong to the French or that the instruments used in hanging or torturing criminals are part of European culture. Would the French have to prove persistence or continuity in order to be able to keep their hanging systems? One major characteristic of culture is continuous evolution and yet these rules are asking claimants to submit evidence of ‘persistence of belief, persistence of culture’. Many African societies have, as a result of relentless and intensive efforts at Christianisation by the missionaries and colonial government pressure, abandoned traditional religious beliefs and practices. Are Africans and others now to be told by the same former colonial governments and their museums that they are not entitled to objects that are evidence of past practices because of lack of continuity or persistence of beliefs? Obviously, such rules are made to prevent recovery of artefacts by former colonial subjects. They will be kept by the former colonial power that can also not demonstrate any continuity of beliefs or practice but feels entitled to hold the object in their museums. These questions on continuity and links to the old culture are another way for Europeans to continue supervising Africans and to dictate what they do with their own artefacts. A little reflection on these words will show how unfair and unjust these rules are. Having looted a cultural object and kept it for more than hundred years the claimant is now asked questions which should actually be properly addressed to the holder of the objects i.e. the Dutch State and its museums. 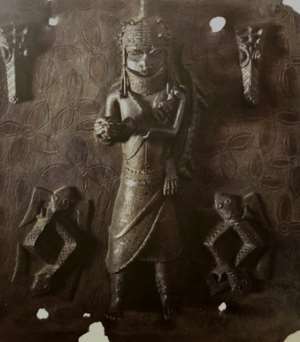 If we recall that most Africans and probably others do not know where the Europeans took all the artefacts they looted or seized, whom they gave or sold to and now, after 100 years when Africans seek the return of the looted artefacts, they are required to submit documented history of the objects, history that relates to the period when the objects were no longer in the possession of the original owners. In my view, the burden of proof should be on the museum or other holder of a looted African artefact. It is a fact of history and common knowledge that most African artefacts in Europe and especially in European museums, were looted, stolen or otherwise acquired under dubious circumstances. Once claims are submitted, ‘the museum staff will undertake research.’ (6.7) This provision surprises me for I thought the museums were conducting research on the objects they are holding. To hear after hundred years of deprivation of a cultural object that the museum is now doing research on the object is discouraging. What have the museums being doing in all these hundred years? Of course, much of the talk about the need for provenance research is tactical and affords the museum good excuses for delays. What have the many researchers and professors of Cultural Anthropology, African Studies, African History been doing all the time? 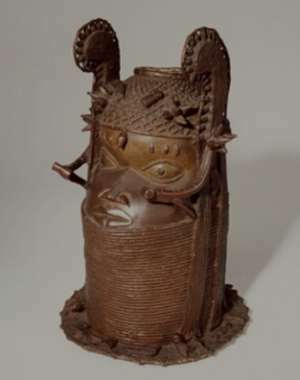 Commemorative head of an Oba, Benin, Nigeria now in Volkenkunde Museum, Leiden, Netherlands. What about objects such as the Benin artefacts that do not really require any provenance research since everybody knows where they came from? They were all looted in the 1897 British invasion of Benin City. Who eventually brought such artefacts to the museum should have been registered long ago. Or do the museums not ask such elementary questions? In looking at some of these new rules one has the impression that the claimants are being treated as people demanding welfare benefits from the Dutch authorities and not people or institutions requesting the restitution of their artefacts which were undoubtedly looted. Should States submit themselves to such a procedure? I should think a direct demand to the Dutch government must be enough. The declaration issued after the meeting is a move in the right direction, but it failed to state clearly a political direction on the issue of restitution. The usual phrases about associating the countries of origin, cooperation and training for museum officials and scholarships were also reiterated. The impression here is that Germans are burying the main issue of restitution in a lot of other matters that are no doubt useful and important but not directly relevant to the issue of restitution. The Germans are still far behind the French since President Macron has made a clear and firm commitment to restitution of looted artefacts from former French colonies and the Sarr and Savoy report has clearly indicated the necessary measures. Ancestor couple, Chibinda and his wife Lweji. Chokwe. Democratic Republic of Congo, now in Tropenmuseum, Amsterdam, Netherlands. Belgians have still not even entered the heart of the debate on restitution, having recently re-opened the museum built by the cruel Leopold ll, the Royal Museum for Central Africa, or Africa Museum, at Tervuren. The museum does not seem to be able to determine which name to use generally. Even in its recent publications, we still find the old name of Royal Museum for Central Africa. From the Swiss, Italians, Danes, Swedes, Spaniards, Portuguese and others one hardly hears anything about restitution of looted African objects even though some of the finest African art objects can be found in these countries. (11) They will sooner or later have to respond to pressures created by Macron’s declaration and the Sarr-Savoy report. The positive reaction of many to the Dutch announcements about the new rules and the travel of a museum official to Sri Lanka are probably due to the consistent refusal of many Europeans even to discuss the issue of restitution. An announcement of new rules on return of looted artefacts then appears as progress, no matter what the substance of the rules may be. 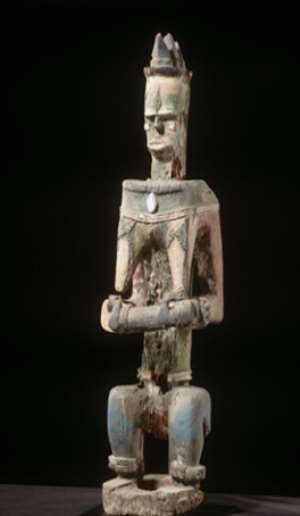 We should note that this enthusiastic and favourable reception that the announcement of the new Dutch rules received came a few months after the Benin Dialogue Group had decided and announced in a communique that it had deleted restitution of Benin Bronzes from its agenda. Was the press conscious of this remarkable and important development? Did they decide that despite this action which was intended to stop speculation of possible restitution, the new rules signalled favourable attitude towards restitution demands? Mother and child,Urhobo,Nigeria, now in Afrika Museum,Berg en Dahl, Netherlands. Nowhere is there any evidence that Macron’s famous declaration at Ouagadougou has had any impact on the thinking of Dutch museums, at least these rules do not show this. On the contrary, they seem to put many obstacles on the way of claimants, requesting documents that many claimants cannot possibly possess. The museum that has kept the looted objects for more than hundred years should have the information it seeks from the claimant. These new Dutch rules, like the German Guidelines, do not bring us any nearer to factual restitutions: they are mostly akin to politicians’ tactics of a policy of announcements and declarations of intentions. They show no signs of urgency about the need for restitution. The museums do not perceive the colonial system for what it was: a gigantic racist oppressive scheme to exploit Africans and take control of their resources, including cultural objects, as well as to exploit their human labour. So, what would we expect from a policy that is positive, clear and serious about restitution? 2. A clear and unequivocal political statement indicating commitment from the head of State or government, minister of foreign affairs or minister of culture that is an expression of a decision of the authority with power to dispose of State property such as looted artefacts. 3. Establishing a burden of proof on museums and other institutions to establish the legality of their acquisitions. Where the museums or other State institutions cannot establish legality of acquisition, steps should be taken to return objects to rightful owners in the country of origin. 8. Clear approach. Each country may have its own approach to the question of restitution but the French method of appointing a commission of 2 scholars (one African and one European) seems to me recommendable. Such a commission should report within 6 months. As far as we can tell, the Dutch State as such, has not taken any clear policy decision on restitution of artefacts looted during the colonial era. These rules are by a few museums holding State owned collections. The unwillingness or the inability of our contemporary Westerners to abandon completely the colonialist ideology underlies the very reluctant steps taken to create a semblance of movement towards restitution. The condemnable values created by colonialism appear to have secured permanent place in the Western mind, overcoming all other values, be they religious, moral or otherwise. We thus have, in our present time, Westerners justifying the looting of Ethiopian Christian crosses by European Christians and a refusal to return the loot to Ethiopia. Artefacts have assumed in the prevailing ideology a value beyond all other values. Imagine having to compare the relative importance and value of a looted object in Holland and in its country of origin. This is surely a perversion that could only be understood on the basis of colonialist ideology. The makers of this rule would not have seen the perversion since they do not see restitution as a stage in the process of decolonization. Decolonization of museums with people who do not see the evil in colonialism is a difficult task. They would also not see that the obligation to compare the merits of keeping an artefact in Holland and those of sending it back to its country of origin could in some cases lead to approval and confirmation of the original looting. Relief, Benin, Nigeria, now in Volkenkunde Museum, Leiden, Netherlands. 1.“Die Rückgabe jener Kulturschätze, die unsere Museen und Sammlungen direkt oder indirekt dem Kolonialsystemverdanken und die jetzt zurückverlangt werden, sollte ebenfalls nicht mit billigen Argumenten und Tricks hinausgezögert werden“. Gert v. Paczensky and Herbert Ganslmayr, Nofretete will nach Hause, p.185, C. Bertelsmann, München, 1984. 3. https://www.tropenmuseum.nl/sites/default/files/2019-03/Claims%20for%20Return%20of%20Cultural%20Objects%20NMVW%20Principles%20and%20Process_1.pdf see Annex II. It should be noted that the majority of members of the Benin Dialogue Group follow the discredited Declaration on the Value and Importance of Universal Museums (DIVUM),2002, in spirit if not the text. 9. Germans seem really to have serious problems in accepting what really happened under their colonial rule even though the majority of their scholars are agreed on the main characteristics of German colonial atrocities as preparatory experience for Nazi crimes. Besides, German authorities seem to fear creating any impression that the colonial crimes were as evil and condemnable as crimes under Nazi regime. Thus, whilst German authorities are willing and ready to acknowledge Nazi crimes as crimes against humanity, they are unwilling to say that as regards colonial atrocities. They merely say that colonial crimes are condemnable by our standards today, leaving open the conclusion that those events were not condemnable or illegal at the time of commission in the past. The politicians here seem concerned that anybody might think they were putting Nazi atrocities on the same level as German colonial atrocities. The holocaust is declared to be without precedent and not comparable with any other event. An astonishing statement if we recall that they were here dealing with unlawful and atrocious events of the colonial regime. Did they have to bring in the holocaust in order to diminish the extent of colonial genocide? German intellectuals have maintained that there are continuities or at least the connections between the colonial regime practices and Nazi practices. See Henning Helber, ‘Das Stammeln vom Grauen. Von der Geschichte und Gegenwärtigkeit des deutschen Kolonialismus‘, DIEWOCHE Sonnabend/Sontag,16/17 Marz 2019. 11. We should hear in the near future debates on restitution of looted African art in Switzerland, Italy, Denmark, Sweden, Norway, Spain, Portugal etc. There is no way these countries could escape the historical movement towards restitution of looted objects. 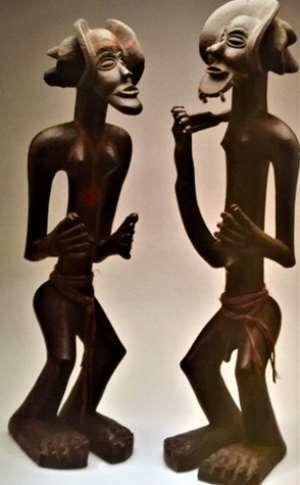 See for example, the rich collection of African art in Switzerland. The Netherlands’ National Museum of World Cultures (NMWC) has pledged to proactively return all artefacts within its collection identified as stolen during the colonial era. The policy means the museum will not simply respond to restitution claims, it will actively work to identify objects that were acquired through theft. Once objects are flagged, the museum will welcome claims from their country of origin, although final approval remains with the Dutch government. The museum does not intend to place any restrictions on how the objects should be used or managed after they are returned. The museum says it could enter into talks with the objects’ countries of origin, including Sri Lanka and Indonesia. Quatre institutions néerlandaises vont étudier l’origine de près de 450.000 objets d’art, dans le but de les restituer à leurs ayants droit, principalement des pays africains. Alors qu‘en France, la question de la restitution à leurs pays d’origine d’œuvres d’art spoliées lors de la colonisation suscite un important débat, quatre musées publics néerlandais ont décidé de s’engager sur cette question, selon Les Échos . Deutschland wird noch in viele Richtungen debattiert. Doch die Niederlande haben nun die Initiative ergriffen und gehen bei der Restitution kolonialer Raubkunst an die eigentlichen Besitzer voran. The Principles and Process for Addressing Claims for the Return of Cultural Objects sets out the process by which objects/collections can be claimed for return from the Nationaal Museum van Wereldculturen. The Principles and Process expresses the overall mission of the museum to address the long, complex and entangled histories that have resulted in the collections the museum holds. It is part of a larger commitment made by Nationaal Museum van Wereldculturen (NMVW) to the role of collections in national public life, a commitment that includes researching and making publicly accessible its collection, addressing provenance issues arising from colonial appropriations, developing new ethical possibilities for collections, putting contemporary communities on an equal footing as national collections and engaging in dialogue with communities and nations of source, nationally and internationally, who have particular attachment to the collections. These Principles and Process make clear NMVW’s commitment to transparently address and evaluate claims for the return of cultural objects according to standards of respect, cooperation and timeliness. Nationaal Museum van Wereldculturen recognizes that claims can only be successful when made in a context which allows for consultation and open dialogue and clear communication by all parties. NMVW undertakes to provide guidance in regard to the process for claims being made and provide access to information held by the museum in regard to histories of collections so that claimants can be informed at all stages. NMVW do not view this process as adversarial though claimants and NMVW will be involved in processes of which require documentation, information and evidence for evaluation and assessment in order that just and fair solutions can be reached. NMVW believes that claims may be the result of an ongoing relationship between the museum and claimant parties as well as the beginning of one. As custodian of the national collections the Nationaal Museum van Wereldculturen works within a national and international legal context. These accord an important role to cultural property and national heritage in the lives of individuals, communities and nations, and recognize the need to safeguard them in conditions of armed conflict as well as the necessity of preventing illicit trade and illegal seizure. The international context is guided by the UNESCO (1954; 1970) and UNIDROIT (1995) Conventions, as well as UN Declarations (2007), amongst others. The national context is legislated by the Heritage Act (Erfgoedwet) 2016. All national collections in the Netherlands are property of the Dutch State and therefore any decision to permanently transfer these out of the national collection requires assent of the Ministry and Minister for Education, Culture and Science. This is in keeping with articles 4.17 to 4.21 of The Heritage Act (Erfgoedwet) 2016. This requires that all objects alienated from the national collection must be measured against criteria of cultural-historical or scientific significance as Dutch cultural heritage. To allow all parties to act with transparency and integrity, NMVW will appoint an independent Standing Advisory Committee, with an independent Chair to review and evaluate all claims and all parties’s arguments. The Committee will ensure standards of documentation and research and to make definitive recommendations to the Ministry/Ministry, in keeping with its understanding of the issues, as well as the national and international frameworks that protect cultural property and heritage. The Principles and Process for addressing claims for the Return of Cultural Objects has been adopted by the Nationaal Museum van Wereldculturen (NMVW) and is applicable only to the collections of which it is a custodian. It does not apply to any claims for the return of objects from other national collections. In addition, it does not apply to those arising out of the World War II era in Europe. These are covered by the Dutch Restitution process/Dutch Restitution Committee and should be referred there. The Principles and Process for the claims for Return of Cultural Objects is set out in the following way. Sections 1-3 introduce the museum, its mission, the international and national context. Section 4 identifies the criteria under which objects can be claimed including providing three broad categories: questions of legality (4.2), involuntary separation (4.3) and heritage value (4.4). Section 5 identifies how the claim will be assessed by listing the considerations that will be taken into account. It therefore addresses the nature of information that should be provided and considered by all parties to make a claim in accordance with the criteria in section 4. Section 6 identifies in broad terms the procedure for making a claim for those collections belonging to the Dutch State of which the NMVW are the custodian. Section 7 identifies in broad terms the procedure for making a claim for those collections that do not belong to the Dutch State of which the NMVW are the custodian. Section 8 identifies the process following a successful claim. The Principles and Process –document has a glossary to explain all the terms used in the document. Appendix 1 defines the constitution and role of the Standing Advisory Committee Appendix 2 provides an overview of the types of information required in the claim. This framework is applicable only to the collections of which Nationaal Museum van Wereldculturen (NMVW) is currently the custodian. Any claims for the return of objects pertaining to World War II era in Europe are covered by the Dutch Restitution process and should be referred there. These do not fall under this framework. 1.1 The Nationaal Museum van Wereldculturen (NMVW) is the Dutch national institution designated for the research, interpretation, preservation and public access to the ethnographic collections/world cultures in the possession of the Dutch State. As the national museum, with this remit, the NMVW is the custodian of a national collection. 1.2 The NMVW mission is that of providing an inspiring and open view of the world and working with institutions and individuals to contribute to inspiring world citizenship nationally and internationally. NMVW has a strong focus on promoting access to its collections, in situ and online, and recognizes that its collections are subject to a number of entanglements across the world, as cultural objects have emerged from a long and complex history of global relations. 1.3 These Principles and Process sets out the context, criteria and process that will be used by NMVW for evaluating claims for return of cultural objects of which Nationaal Museum van Wereldculturen is currently the custodian. 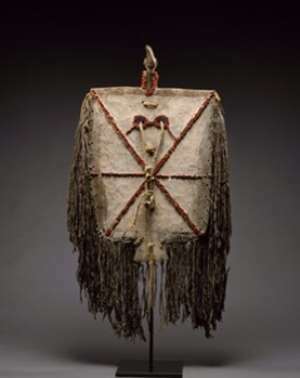 Specifically, it represents NMVW’s commitment to transparently address and evaluate claims for the return of cultural objects according to standards of respect, transparency and timeliness. 1.4 These Principles and Process operates in tandem with the NMVW’s ongoing programme of supporting and engaging in provenance research for the establishment of histories of cultural objects and collecting. It is consistent with NMVW’s commitment to develop new ethical possibilities for collections, for example by means of collaboration, display, and research. 2.1 These Principles and Process for return of cultural objects operates within an international context and recognizes the intentions and importance underlying certain international instruments which specifically address issues of cultural property, restitution, repatriation and return. The citations here are not comprehensive but highlights those of especially significance to this framework. 2.2 UNESCO 1954 (Netherlands signatory 8 March 2007, retroactive to 14 Jan 1959) The UNESCO Convention for the Protection of Cultural Property in the Event of Armed Conflict represents the first international multilateral treaty with a universal vocation exclusively focused on the protection of cultural heritage in the event of armed conflict. The 1954 UNESCO Convention became legally binding in the Netherlands in 2007, with the adoption of the Cultural Property (Return from Occupied Territory) Act (also called Hague Convention). It has retroactive effect to 14 January 1959.
retroactive effect. This means that return procedures can only be started under the 1970 Convention in the Netherlands when cultural property has been illegally removed from a Member State after 1 July 2009. The Heritage Act (Erfgoedwet) 2016 currently enacts this obligation (article 6.1-6.15). 2.4 UNIDROIT 1995 (Netherlands signatory 28 June 1995) The UNIDROIT Convention on Stolen or Illegally Exported Cultural Objects establishes minimal legal rules for the restitution and return of cultural objects between Contracting States, with the objective of improving the preservation and protection of the cultural heritage. The Convention applies in respect of cultural objects that were stolen or illegally exported. The Netherlands is a signatory to the UNIDROIT Convention but has not ratified it. 2.5 UN 2007 (Netherlands voted for adoption in 2007) The 2007 UN Declaration on the Rights of Indigenous Peoples seeks to establish a framework for securing basic standards for the survival, dignity, well-being and rights of the world’s indigenous communities noting that “States shall provide redress through effective mechanisms, which may include restitution […] with respect to their cultural, intellectual, religious and spiritual property taken without their free, prior and informed consent or in in violation of their laws, traditions and customs”. 2.6 Washington Principles 1998 The Washington Conference Principles on Nazi Looted Art of 1998 provides non-binding principles to resolve questions of Nazi-confiscated art and recommends national processes for their implementation. The eleven principles advocate, amongst other things, the importance of institutionally based pro-active provenance research, the importance of transparency in terms of collections and archives to allow third party research, and the need for just and fair solutions to claims. In the Netherlands, an independent Dutch Restitution Committee was established in 2001. 3.1 These Principles and Process for return of cultural objects also operates in a national context, specifically The Heritage Act (Erfgoedwet) passed 1 January 2016. 3.2 The most important aim of the Heritage Act is to stop the fragmentation of Dutch cultural heritage through legislation and to promote a comprehensive protection regime for cultural heritage, with shared definitions, procedures, and protection measures for immovable, movable and intangible cultural heritage. 3.3 The Heritage Act (Erfgoedwet) is a national framework for the understanding of cultural heritage and cultural objects (“cultuurgoed”, translated as both cultural property and cultural objects in English) which it defines according to the UNESCO Convention, namely that cultural heritage is a matter that has been designated by each state for religious or worldly reasons as important for archeology, prehistory, history, literature, art or science and is therefore essential for a nation’s (here the Kingdom of the Netherlands) cultural heritage. 3.4 The Heritage Act (Erfgoedwet) identifies the Dutch State as the owner of the national collections. Any recommendation for return and thus permanent transfer of ownership (alienation) of cultural object(s) in the national collection out of the custodianship of NMVW will require the assent of the Dutch State through the Ministry and Minister (under articles 4.17-4.21 of the Heritage Act). 4.1 Cultural objects that will be considered for return will comply with one (or more) of the following criteria. 4.2.1. Acquired from a possessor who acted in contravention of the standards of legality at that time and who did not have legal right to ownership of the cultural object(s); 4.2.2. Acquired from a possessor found since acquisition to have engaged in illegal practices relating to the ownership of cultural object(s). 4.3.1 Acquired without the consent of owners; 4.3.2 Acquired under conditions of duress that can be understood as forced sale; 4.3.3 Acquired from a possessor who was not culturally authorized to dispose of a particular cultural object(s), in that the customary/traditional context identifies the cultural object(s) as inalienable communal property. 4.4.1 whose sacred purpose make them unsuited to public display and continued scientific research; 4.4.2 whose relative national historical significance outside the Netherlands or influence on continuous cultural wellbeing outside the Netherlands outweighs all benefits of retention by the national collection in the Netherlands. 5.1 The claim will first be assessed in terms of where it falls into scope in accordance with the criteria (article 4) above. 5.2 Questions of legality (4.2. ), involuntary separation (4.3) and heritage value (4.4) will be evaluated through detailed and responsive provenance research which will aim to trace the full history of acquisition and ownership of the cultural object(s). Claims should include all known and documented aspects including questions of ownership and history of possession; the connection between the claimant and the cultural object(s); cultural and national context and any potential rights and claims by other potential applicants. 5.3.1 Standards of continued custodianship: the benefits of safeguarding cultural objects to ensure as far as possible they are used for cultural and heritage purposes when returned to the nations and/or communities of origin. 5.3.2 Cultural heritage and identity: the recognition that cultural objects may be indispensable to nations and/or communities in understanding and/or continuance of their origins, heritage, beliefs and culture. 5.3.3 Cultural continuity/genuine link: a demonstrable continuity/genuine link between the claimants and the cultural object(s) claimed, in terms of national heritage, persistence of beliefs, persistence of culture. 5.3.4 Just and fair solutions: this may include recommendations for models alternative to return that are acceptable to all parties – these might be exhibitions, loans, and sharing of information and knowledge on a number of platforms. This may include strategies for ongoing collaboration/relationship building. 5.4 Unavoidable gaps and ambiguities may exist through absences arising from the nature of museum documentation and recorded histories. In claims that cannot be documented according to the guidelines listed above, the principle of reasonable doubt (see glossary) may be applied. 5.5 In keeping with NMVW’s role as a custodian of a national collection, a claim should identify national government or national (cultural) institutional support, or overtly state why this is not applicable. NMVW may wish to confirm said support. 6.1 For claims which pertain to the national collection, final assent for return of the cultural object(s) lies with the Minister. NMVW will process claims in a consistent manner (article 5) and all documentation and findings are submitted to a Standing Advisory Committee (hereafter Committee) for definitive recommendations, and then for final decision by the Minister. 6.2 Claims must be officially made in writing to the Director of NMVW. 6.3 Claims should set out the nature of the claim, including inventory numbers of cultural property requested, and all relevant evidence and argument for the claim. 6.4 Upon receipt of the claim, the Director will acknowledge the claim in writing and copy correspondence to the Ministry. 6.5 NMVW staff will then undertake research. NMVW do not consider this process adversarial but to be undertaken in consultation and may contact claimants during this process. Outside experts may be commissioned to provide further advice. NMVW will undertake to complete this process within six months, with a possible extension of six months. 6.6 Claims will be reviewed by NMVW in accordance with the standards of due diligence: namely the requirement that all reasonable endeavours are made to establish the context and facts of a case before deciding a course of action. 6.7 NMVW will then submit their research, findings and issue a provisional recommendation to the Committee for review and issuance of definitive recommendations. The Committee will complete this process in three months with possible extension of three months. 6.8 The Committee will issue a definitive recommendation in writing to the Ministry and Director of NMVW. The Minister will issue his/her decision. NMVV will inform the claimants of the Minister’s decision within four weeks of receipt. 7.1 For claims which pertain to owners other than the Dutch State, NMVW will refer the claim to the owners within four weeks of receiving the claim. 7.2 Claims must be officially made in writing to the Director of NMVW. 7.3 Claims should set out the nature of the claim, including inventory numbers of cultural property requested, and all relevant evidence and argument for the claim. 7.4 Upon receipt of the claim, the Director will acknowledge the claim, refer the claim to the owners. NMVW intends to have them responding within six weeks of receiving correspondence, identifying their preferred course of action. 7.5 In the absence of response the NMVW may seek to investigate the claim in accordance with procedure used for cultural objects belonging to the Dutch State (article 6) and with national/local government sanction providing recommendation to the owner and informing claimant of state of claim. 8. Successful claims, further processes. 8.1 Each party will bear its own costs in relation the processing of the claim under these NMVW principles and process. NMVW will provide professional support to successful claimants regarding facilitation of return. Depending on scale NMVW will work to a timetable of a year maximum for return. 8.2 Archival material will be copied and provided to successful claimants to accompany return of the cultural property. 9.1 These NMVW-principles and process will be periodically reviewed and draw from precedent allowing it to be adapted and improved. Equally, national developments in state policies regarding return may have to be taken into account and could lead to alterations over time. Claimants: every legal or natural person who makes a claim in writing to the Director of the NMVW requesting the return of one or more cultural objects. Claimants include can include 1) Individuals; 2) Governments/governmental actors; 3) Communities, polities or sub-State entities with nationally recognized political governance; 4) National (cultural) institutions. Cultural object and cultural heritage are used in preference to cultural property. Cultural object a movable item forming part of cultural heritage. Cultural heritage tangible and intangible resources inherited from the past, created in the course of time by people or arising from the interaction between man and the environment that people, irrespective of the ownership thereof, identify as a reflection and expression of continuously evolving values, beliefs, knowledge and traditions and that offer a frame of reference to them and to future generations. Just and Fair Solutions aim to achieve a consistency of recommendations in response to varying circumstances and facts linked to specific cases, as advised and implemented by the Washington Principles of 1998. Involuntary separation /involuntary disposal: Involuntary separation is used in preference to involuntary disposal. Involuntary disposal is understood as transfer by gift or sale, involuntary disposal is understood to mean where consent was clearly constrained. Involuntary separation transfer of objects where conditions of consent are not met including clear absence of owners/possessors due to persecution/conditions of coercion; disposal under conditions of constraint, of confiscation, misappropriation or other forces of coercion that are known and can be evidenced through archival, historical, art historical or social anthropological research. Custodian/possessor/owners: Custodian those who have the custody over a cultural object (but do not necessarily have legal ownership of it). In this framework custodian will only be used in regard to NMVW as an entity who legally holds the object for the owner, the Dutch State. Possessor those who hold a cultural object in their possession and may transfer it but do not necessarily have legal ownership of it. Owner those who have a legal title to a cultural object (but do not necessarily have it in their possession). Both natural and legal persons as well as communities can have ownership of a cultural object. Ownership is habitually determined in relationship to the national law of the country of origin of the cultural object. Nations and/or communities of origin nations and/or communities who can demonstrate a genuine link/cultural continuity in cultural heritage terms to the cultural object(s) in question, such that the cultural object(s), or the category of objects in question has/have over time become of demonstrable value to the nation and/or community in question. Minister/Ministry: Minister of Education, Culture and Science, (Minister van Onderwijs, Wetenschap en Cultuur). Ministry Ministry of Education, Culture and Science (Ministerie van Onderwijs, Wetenschap en Cultuur (OCW)). Party Party claimant(s), NMVW or owner(s). Return/restitution/repatriation: All these terms refer to mechanisms for transfer of cultural objects. This framework uses the term return to cover meanings implied by the terms restitution (the transfer of stolen material in the strict sense) and repatriation (the transfer of material ascribed to a particular cultural patrimony). Reasonable doubt Reasonable doubt exists where there is no other explanation that can be concluded from the facts available and there exists no reasonable alternative to conclusions drawn. Standing Advisory Committee (definition and role) The Standing Advisory Committee’s (hereafter Committee) will work in accordance with the criteria, guidelines and procedures identified in the NMVW-principles and process. Task: At the request of the Director of NMVW, the Committee’s task is to review all documentation relating to claim, created by all parties and confirm that this is of suitable standard for definitive recommendations to be made. The Committee will then issue definitive recommendations on claims for return of cultural objects in accordance with standards of objectivity, fairness and transparency. The Committee will aim for consistent decision making – namely to undertake this in accordance with standards of due diligence and with regard to just and fair solutions. Constitution: The Standing Advisory Committee will be no more than 7 members, including Chair and Deputy Chair. The Chair should have experience or expertise of reviewing cases linked to cultural objects from a legal standpoint. The Committee should include at least one member whose expertise lies with matters of colonial and imperial history as pertains to the Netherlands. The Committee should include at least one member whose expertise lies with matters of archival and provenance research preferably in matters linked to non-western cultural object(s) in museum contexts. The Committee should include at least one member whose expertise lies with matters of art history, material culture and museology preferably in regard to non-western cultural object(s) It will be beneficial for the Committee to draw from the currently constituted committees in the Netherlands, including the Dutch Restitutie Commissie; the Berschermwaardigsheid Commissie (OCW); Ethics Commissie (Museum Vereniging). Any members above can have served, or indeed members of these committees may be in certain instances co-opted. Recommendations: Among other responses the Standing Committee may recommend that:  The cultural object(s) should be returned;  That the cultural object (s) should not be returned, but other solutions to access are important to promoting settlement and dialogue on the matter;  That the cultural object(s) should not be returned, but consideration will be given to other provisions;  The cultural object(s) should not be returned. Issuing Definitive Recommendation: Definitive recommendations will be issued by a Committee attended and discussed by at least three Committee members, attended by the Chair or Deputy Chair. The Chair of the Committee will formerly issue the definitive recommendation in writing, signed and dated. Confidentiality: The Committee will undertake to keep confidential all matters linked to private individuals. Liability: The members of the Committee are not be liable for any actions or omissions with regard to disputes made by parties under this framework. This is in addition to any correspondence. All claims can be made in English or Dutch. Brief description with object number(s). See glossary definition: identify whether individual; government/governmental actor; community of sub-state entity; national cultural institution. Reason for cultural object being claimed by claimants: described the reason for the claim in regard to the criteria identified. This should identify whether the cultural objects are being claimed due to questions of legality (4.2), involuntary separation (4.3) and/or heritage value (4.4). The criteria themselves should guide the argument being made. For example, if a cultural object is being claimed in relation to 4.2, it would be important to identify how it is known that the item was taken in contravention of legal frameworks – using any known facts or circumstances, documentation to support this claim. 5. Case for claim:  Statement of connection between claimant(s) and cultural objects. o demonstration of a genuine link/cultural continuity in cultural heritage terms to the cultural object(s) in question, such that the cultural object(s), or the category of objects in question has/have over time become of demonstrable value to the nation and/or community in question.  Assessment of cultural significance of cultural object being claimed (for claimants).  Statement of role of heritage/object within tradition, cultural, national life and thus significance, as well as evidence of significance. This can either apply to the ‘category’ of cultural object (e.g. ‘works by Rembrandt’) or the object itself (e.g. : ‘The Nightwatch’). or it is understood that the idea of what ‘evidence’ is may be sensitive/differ in different contexts. It may be able to be provided in ways other than writing, archival evidence or existing text, e.g: oral histories, testimonies. How claimants can effectively do this, can be discussed in consultation.  Provenance. Statement of known and documented aspects of making, ownership and transfer in the history of possession of the object/s. o reference to archival documentation, testimony and evidence here important, they may be written or conveyed in other forms.  Projected custodial responsibilities on return: identification of public/cultural role of return cultural object(s) o What are the intentions for the cultural objects once returned.  Potential rights and claims by other potential applicants. o Are such/these cultural objects know to be contested, or difficult to allocate to specific claimants, are there likely contestations?  Statements of support by national cultural institutions/national government form claims made by sub-national polities or individuals. o This is important in terms of national support, but claimants may be able to provide reasons why this is not appropriate as well.  Reasons for lack of evidence. This author has authored 240 publications on Modern Ghana.